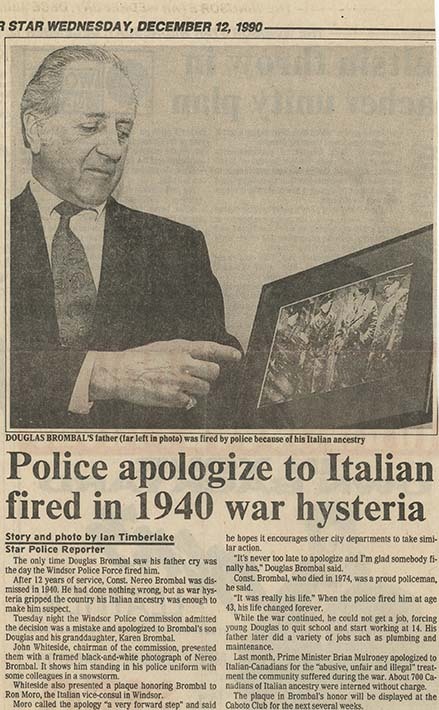 Newspaper article "Police apologize to Italian fired in 1940 war hysteria", Windsor Star, December 12, 1990. Doug Brombal is pictured holding a framed photograph of his father in police uniform along with his colleagues. Brombal would never return to his position as a police officer. However, in December 1990, the Windsor Police Commission apologized to Brombal’s family. They also created Camp Brombal, for underpriviliged kids, and run by volunteers from the police department, in Nereo Brombal’s honour.